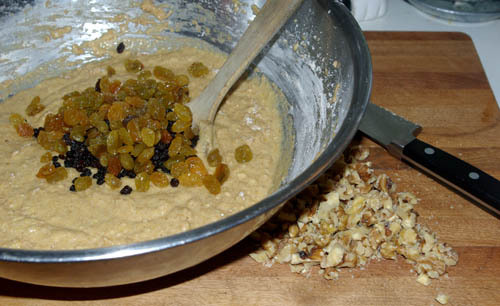 Baking is the technique of prolonged cooking of food by dry heat acting by convection, and not by radiation, normally in an oven, but also in hot ashes, or on hot stones. It is primarily used for the preparation of bread, cakes, pastries and pies, tarts, quiches, and cookies. In short, this is a very very old process. Indeed, when humankind mastered the art of fire, they shifted from a hunter/gatherer lifestyle, to an agrarian lifestyle. 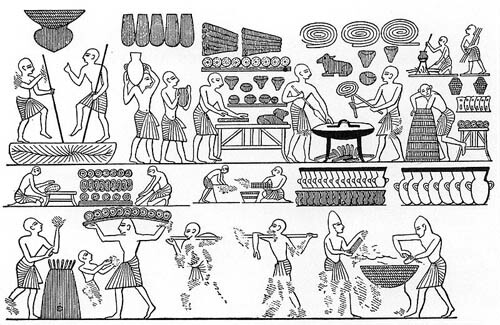 And the experimentation of what one could do with various grasses and grains, including the first baked breads, emerged. Our soul memory on baking is extremely old. It’s in our genes. While I know that many many of my loyal readers do, in fact, bake, my realization is that the majority of women, particularly young women, do not. They are busy and they grab mixes off the shelves of local markets–even health food markets. Here’s what I want you to know. First, baking is really easy. Impossibly easy. You have access to a zillion recipes in seconds simply by googling. And if you can read a manual, you can read a recipe. And, there are all levels of baking. I’m busy, too. Pick the easy recipes. The fast recipes. If you master one or two or three and you will already be way ahead of your peers, will advance your lifestyle by you won’t believe what quantum number, and your family will never forget that you did. 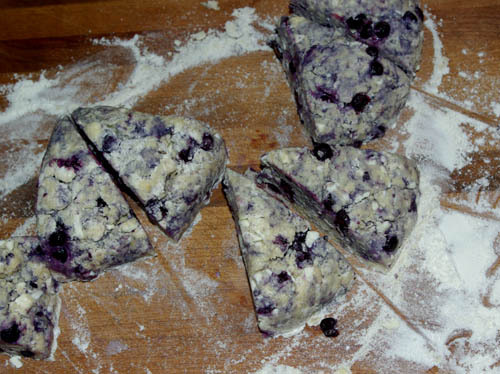 Scones ready for oven–so wonderful in their messiness, and about to be transformed! Secondly, if you bake you will save tons of money. You may think you are “saving time” by grabbing something off the shelf, but you are spending a lot more of your income. What do you pay for a scone? I make at least eight each week and freeze them as soon as they cool off, each in an individual plastic bag. I have one with tea in the morning. I know I’m getting butter, fresh organic eggs, cream, healthy flour and organic fruit, often blueberries or, in summer, wild blackberries I can pick in my own garden. Let’s see. I am spending under $2.00 for eight scones. What are spending at your local coffeeshop for a muffin? See? And it’s like this with anything you can imagine. You save your money while increasing the value of what’s available to you and your family at any given moment. You have good food on hand. Thirdly, by learning to bake you will change your relationship with yourself by empowering yourself to create food from virtually nothing. Good nothings, but you know what I mean. You can take flour and water and oil and egg and sugar and create something marvelous. Over and over again. In pondering this post I was recalling last evening something my wonderful teacher Angeles Arrien told us about when I was studying anthropology in grad school. She shared that at some point in her early upper education she had participated in a study conducted in nursing homes. The purpose was to find creative ways to impact the well being of those living in nursing homes. These folks found that residents responded very well to the simple act of allowing the smells that come from baking to filter through the air system into their rooms. Imagine the wonderful delicious smells that come from peach pie, gingerbread, peanut butter cookies, puddings, baked apples, ah, yes, and pumpkin bread, a favorite in our home. Imagine the impact that has on you and your family. It speaks of well being. It speaks of luxury. It speaks of comfort. And it speaks of deep nourishment, which you provide. How do you pay for that, short of a chef? Lastly, I am obliged to say that baking is really really FUN! 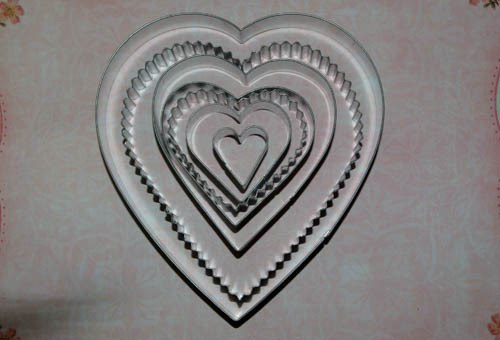 Yesterday I found these heart-shaped cookie cutters and I cannot wait for Valentine’s Day as I am already planning to make butter cookies, the very kind I made when Antonia was a little girl, with frosting. Oh, yes I am. And I stood pondering that teeny heart in the center asking myself, what can I do with that? And realized that the next pie I make with a top crust (though I tend to weave my crusts as I can’t bear not to, they are so amazing) I will embellish with a small circle of hearts. I am excited just to think of it. Am I part Martha? I actually Love to bake, but you were my original inspiration there, as the gifted baker you are! Thanks for sharing this passion with me, and now with your readers! Wonderful! My daughter and I love baking. It is one of the most relaxing, satisfying gifts anyone can give to their family. I love to bake! I don’t know how I found your blog, but it’s great. Welcome Becky! Glad you found your way here. 😉 Delighted that you love to bake! Glad you found the recipe. Yes, I share all my recipes. If something I discovered can make someone’s day, GREAT! Enjoy! Believe it or not, I am a baker, myself. I caught onto it late in life but the most worthwhile aspect of it was exactly as you said – how doggone easy it is. I mean, throw some stuff in the oven and pull it out. I have gotten big on casseroles for dinner too. Peppers, onions, my own seasonings for meats, fruits chunks inside – my plum and pinapples chicken is pretty awesome now! I had a friend who used to come by who I wouold cook for who is glad I relocated. Said he had to go to Atkin’s as soon as I left, lol. It is that good. And the smells….yesss. Yes, yes, yes, home made is better. With all my extra duties this last holiday, I bought a stollen from Germany, at great expense, and was quite disappointed. I used to make dozens of them and give them as holiday gifts. So I went out and bought yeast and all the ingredients. Hopefully next weekend I’ll be pulled together enough to bake 4 or 6 of them. They freeze well. I don’t know that my recipe is the original one, being from an old Farm Jounral baking book, but it’s the one I know and so the one I miss. There are certain baked treats, like there are certain meals, that remind me of my childhood and my grandmother come to visit doing something in the kitchen. I have always been a baker, until lately,when the waistlines got a little thicker. I still bake for sick friends.,and use favorites for dinner invites. At holiday time I bake cookies for all my neighbors and friends. My Mother was not a homemaker and rarely baked so I have to go back a generation, which is a great connection. I have frozen a collection, to share with my sister and brother-in-law, when they come next week. Thanks again, for inspiring so many. You have inspired me for Valentines Day with the heart cookie cutters! I JUST checked, and I have a heart shaped one! I inherited a beautiful set ( just shaped tin, really, but with turned pale green enameled handles, and easily over a hundred years old.) They have languished in the drawer, and now they can be put to use! Isn’t that great to find you already have something that you can use to show others how much you love them! I can see heart shaped sugar cookies, with large crystalline sugar on the top! Great, but kind of sad, post Kathryn. It makes me sad that women don’t bake. I guess they think they don’t have time with their careers. I know I will sound really old-fashioned, but I sometimes wonder what we’ve traded for our suits in the boardroom. I think I can say this, I am happier now than when I was a career woman with two small children in tow. Mmmmmmmmmm!!!! 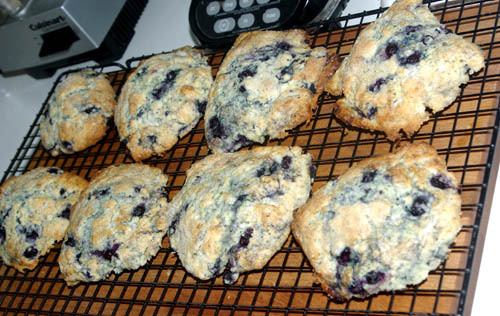 I couldn’t tell whether I wanted to eat the scones before they were baked or after. Looks absolutely scrumptious! And ahhhh our dear Angeles…her presence is always felt after spending time w/ her. Love to you & Antonia during this New Year! Are you enjoying the storm?? Stop, you are making me drool with those delicious pictures of scones and pumpkin bread!! Great post! 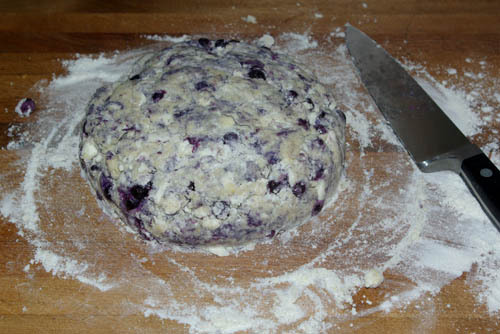 I’ve never made scones, although I’ve thought about do that for a long time! Hubby and I also bake and we love having those wonderful goodies in the freezer when the mood strikes. Thanks again for the great post!